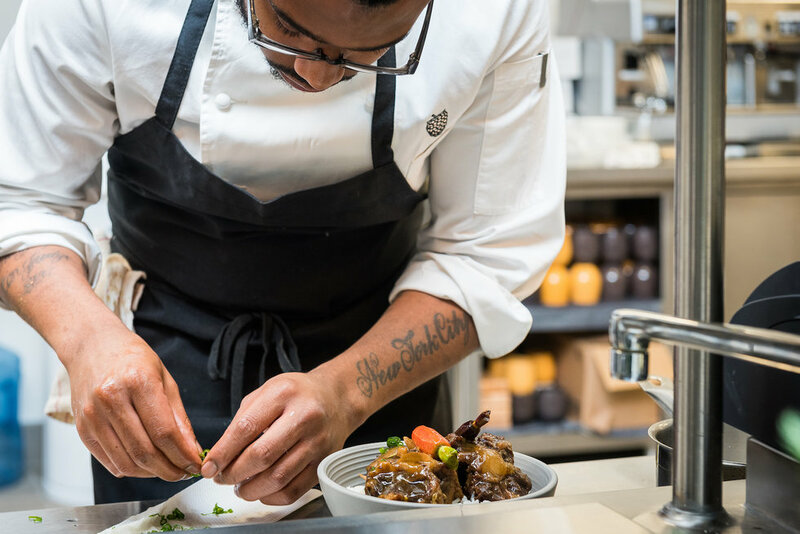 We catch up with the Nigerian-Jamaican chef of the buzzing restaurant Kith/Kin to learn about how his identity shapes his work with fine dining. 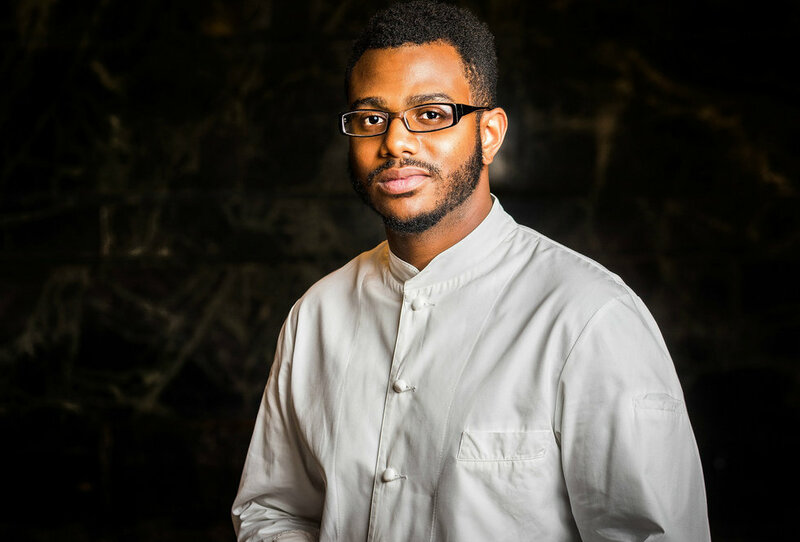 Kwame Onwuachi is an ambitious D.C. chef whose roots go back to West Africa and the Caribbean. His mother sent him from the Bronx to Delta State, Nigeria at the age of 12 to live with his grandfather, a former Howard University professor. Here his grandfather taught him how to make traditional Nigerian dishes and the importance of quality food, leaving a lasting impression on him. The Nigerian-Jamaican culinary artist eventually moved back to New York where he began selling candy on the New York subway to pay his way through culinary school. He would visit his aunts in Washington, D.C. and eventually fell in love with the city. Today, D.C. is the city the 29-year-old continues to build a lasting imprint on the quickly growing culinary scene. While he has worked in kitchens in both New York and New Orleans he has never fully managed a restaurant from top to bottom, his mastery is almost like a grandma who never measures anything when she cooks, but her cooking always perfectly plates the family history. His food is distinctly autobiographical and his confidant command outweighs his experience. He rose to fame on Top Chef season 13, where he cooked his way to sixth place—as well as seen the fall of his fine dining restaurant The Shaw Bijou back in 2016. It's easy for critics to spend too much time eagerly leading conversations with his failure over success, especially someone coming from his background, but Onwuachi doesn't seem too phased by either his wins or loses. 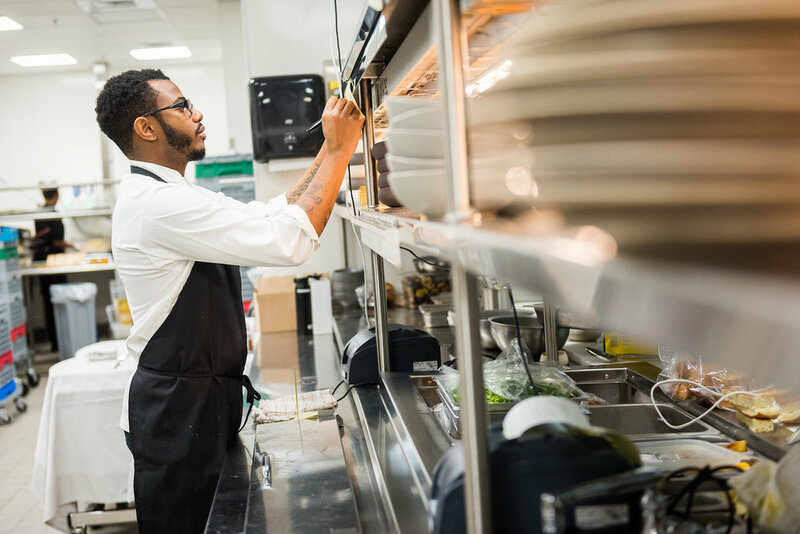 With his nosedive approach to work, he's on a mission to serve up dishes that tell his family's story at Kith/Kin—meaning "friends and family"—at the InterContinental DC. While storytelling through food is nothing new, Onwuachi hopes to add a bit more nuance to tables serving up American classics in Washington, D.C. and beyond. We recently caught up with him to learn more about how food and his migration from the Bronx to Nigeria to New Orleans, and later Washington, D.C. shaped his identity and work as a culinary artist. Photo by Rey Lopez, courtesy of Kith/Kin. What was one of the first things you learned how to make and who taught you how to make it? Eggs. My mom taught me how to scramble them. I would pull up a stepping stool to the stove, watch, and learn. Do you have any special rituals when you get into the kitchen and start creating a new dish? Not really. I'd say that I'm mostly inspired by the things I've eaten and tried before for when it comes to creating something new. Do you have any early memories of being in the kitchen with family, and if so what were some of those? Yes, my family wasn't well off but my mother always wanted to send gifts to everyone. So we would stay up all night making thousands of cookies to share with everyone! Your food has been called autobiographical, in what ways do you hope to connect people to your personal story through food? I hope that people can feel the soul behind my cooking and dishes. My menu is honestly a correlation of autobiographical anecdotes. What were you searching for when you landed on Kith/Kin? I really just wanted to represent my diverse culture. What do you think it is about Kith/Kin that makes it stand out from other restaurants in this city and what do you hope guests walk away telling someone? I think it is definitely the cuisine and the clientele. Our dining room is a rainbow. I honestly hope they walk away telling people how good it is and how great of experience they had. I know you experienced somewhat of a setback when your fine dining restaurant Shaw Bijou shutdown, how did that setback help to refine and refocus your craft? I honestly never stopped. I just started planning what was next for me. You don't have time to stay idle where I come from. I dusted myself off and got back up. You've gone from creating a fine dining sampling menu to Afro-Caribbean inspired cuisine to American classics with Philly Wing Fly. What prompted you to start Philly Wing Fly? I really just wanted to create a space that served American classics like chicken wings, waffle fries and cheesesteaks. It started off as a pop-up in Union Market which was successful, then I was approached with the opportunity to open up a shop in Whole Foods. Does your family have any special holiday cooking traditions? We cook all the time. I have family from everywhere, so whenever we all get together it's a smorgasbord of Caribbean, West African and Creole food. Gumbo during the holidays is apart of that tradition. What has been one of your favorite places to travel internationally thus far? Mumbai, India. I love the flavors, the vibrancy of the city, and the different regions of the city. What are three pieces of advice you'd give your younger self? Don't go to college and collect debt. Listen more. Spend more time with family. How have you learned to define what success looks like for you? Success to me is happiness period. You can be theoretically on top of the world but if you aren't happy you have nothing. More Philly Wing Fry's! It's my version of a fast casual cheesesteak eatery. Keep up with Kith/Kin on Instagram and on their website. Watch Silvastone's new music video. Kwesi Arthur and Bisa Kdei join Silvastone for the remix to his single "Susannah" from his third EP titled Affirmation. The song is an ode to a woman whose "love" and "body" be like fire, as stated on the chorus.